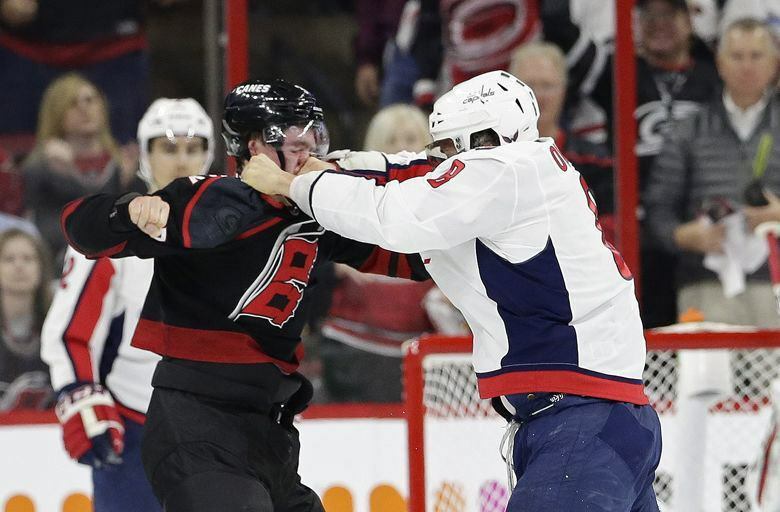 Although the Washington Capitals were able to come out with a win in their first two games, it was clear from the opening face-off that Game 3 would be tough in PNC Arena, where the Hurricanes have dominated this season. Although the Washington Capitals were able to come out with a win in their first two games, it was clear from the opening face-off that Game 3 would be tough in PNC Arena, where the Hurricanes have dominated this season. And surely enough, Washington fell prey to the surge, falling to Carolina 5-0 Monday. The Hurricanes struck first for the first time this series, when Warren Foegele was able to put an awkward shot over the head of Braden Holtby to give the Hurricanes a 1-0 lead. Christian Djoos attempted to clear it form the crease, but the effort was too little, too late. Tension flared through the first period, as the teams exchanged big hits and pushing and shoving. It finally boiled over between Alex Ovechkin and Andrei Svechnikov, and the two dropped the gloves a little over halfway through the opening frame. Ovechkin won the fight, knocking Svechnikov out. The 19-year-old wouldn’t return for the remainder of the game. Foegele would strike again early in the second period, putting the puck past Holtby to make it 2-0 Carolina. Minutes later, Dougie Hamilton struck on the power play to extend the lead to three heading into the third period. Washington managed just one shot in the second. Hamilton also scored twice, getting his second of the net on a third-period power-play to give Carolina a 4-0 lead. Brock McGinn added a goal in the final minutes of regulation to put the Hurricanes up by five. Petr Mrazek had to make just 15 saves on the night for the shutout, while Holtby stopped 40 of 45 shots. Washington, who went 0-for-4 on the power play, gave up five power-play changes to Carolina, which capitalized on two on two of them. The Caps still hold a 2-1 series lead.